During the 1920s, it wasn’t especially normal for a female to imagine competing in sports—particularly if that sport was male dominated—but for Isabel Patricia Coursier, born March 21,1906, ski-jumping was as natural as playing in the snow. 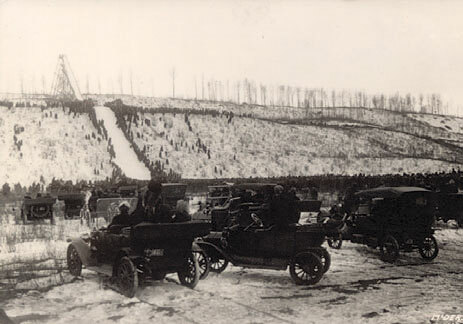 Isabel was 16 years old when she broke a world record, jumping 84 feet in her hometown of Revelstoke, BC at what is now referred to as the Nelsen Historic Ski Jump. From that day forward, Isabel was celebrated as being the first female world champion ski-jumper. In a ski tournament held in Washington on the 4th of July, 1923, Isabel marveled her audience once again, jumping on the icy slopes of Mount Rainier. For this exhibition, she received a special medal and an ovation from the distinguished audience, which included then-president Warren Harding. During this era, Revelstoke was well-known in ski circles for having one of the best ski hills in the world. An excerpt from the Revelstoke Review in 1927quoted a reporter from the Calgary Herald who claimed, “Revelstoke…boasts the greatest ski hill in the world.” The Revelstoke Ski Club was also famed to have produced some of the finest skiers in the world. 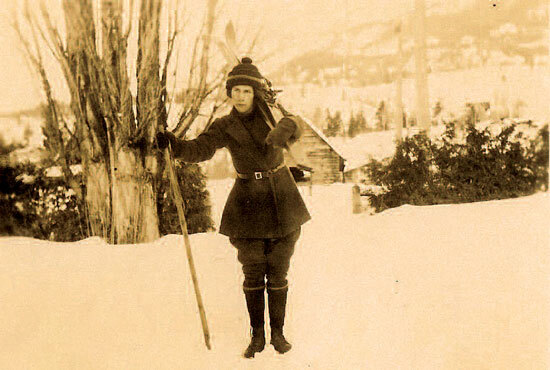 A member of the Ski Club, Isabel confidently jumped alongside her male contemporaries, such as Nels Nelsen, an immigrant from Norway to Revelstoke, who also held a world record for his jump of 240 feet. In practice jumps, Isabel exceeded 100 feet and was the first female to jump unsupported by a male. 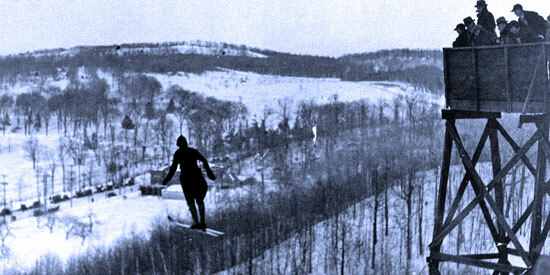 The few women who did venture into ski-jumping contests came down the jump holding the hand of a male jumper. “We did not go in for expensive equipment; parents simply could not afford all the fancy gear that seems to be standard today.” And there was no such thing as special sport clothing, either. Athletes used improvised methods and whatever worked at the time. Isabel would often be seen jumping in army riding britches, men pants, and even her bloomers. Isabel Coursier was world champion from 1922-29, even throughout juggling her studies at the McGill School of Physical Education in Montréal and teaching Physical Education in Victoria. She did eventually give up competitive ski-jumping for her career, still carrying the distinction of “uncontested champion”. Although an excerpt from Sam Wormington’s, The Ski Race states that in 1927, there was some confusion over a New Hampshire girl who claimed the record held by Miss Coursier. The American Ski Association did not recognize jumps made on the Revelstoke hill during Isabel’s time as world champion. However, the matter was recorded as having gone into rectification, and there was no documentation that the title was ever taken away from her. Isabel’s jump in 1922 remained the world’s record for the time being. Her last recorded jump was in 1929. In 1938, Ms. Coursier went to Britain where she taught phys-ed for many years. During the next 25 years, she would frequently bring herself back and forth across the ocean, never seeming to make a choice between the UK and BC. She was a ski instructor in Scotland in 1952 and returned to Canada that same year to teach in Nanaimo. In 1954, Isabel returned again to Britain and studied art in Glasgow, where she lived until 1959. She then left for Canada to teach in Vancouver. Two years later, Isabel found herself back in Scotland, where she taught until her retirement in 1967. She again moved back to Canada and settled in Parksville on Vancouver Island. Isabel Coursier died October 16, 1980 at the age of 74. There is no record of her ever marrying. Top; Isabel Coursier jumping at Montréal, February 20, 1926, age 19. Jump of 103 feet. Middle; Isabel Coursier in Revelstoke circa 1925. Heather has written for various outdoor magazines such as Climbing, Gripped and Kootenay Mountain Culture. In 2005, she started an Arts, Culture and Lifestyles magazine called “Reved Quarterly”, which she publishes independently out of Revelstoke, B.C.